I didn’t have an I-Phone to thumb through at the dinner table when I was a kid, but that didn’t mean there weren’t electronic devices that competed for my attention. I had the radio that sat on the radiator in the living room. In the early days of the western United States, a masked man and an Indian rode the plains, searching for truth and justice. Return with us now to those thrilling days of yesteryear, when from out of the past come the thundering hoofbeats of the great horse Silver! The Lone Ranger rides again! I lived for those words spoken over the radio to the stirring music of the William Tell Overture. Mother planned supper so I could clean my plate in time to hear them at six-thirty. Cleaning my plate was an iron-clad rule in our house. I was often reminded of all the starving children in Europe and told to be thankful for what I had. She knew she could put almost anything in front of me and I would eat it so I could listen to the Lone Ranger and Tonto. A clean plate was my ticket to the radio at six-thirty. I didn’t whine over broccoli or spinach or watery vegetable soup. I loved liver. She held that knowledge over my head like the sword of Damocles. A helping of butter beans showed up on my plate one night. Of all the foods I tried, the only one I absolutely could not eat was a helping of fetid butter beans. I didn’t know it then, but now I know they smelled like the stench of decay in the sump pit of a grain elevator. I looked at them sitting there throbbing malevolently, daring me to eat them. I looked up at the clock on the wall above the ice box. Six-fifteen; fifteen more minutes—the Lone Ranger. I saw him ride up then Silver reared on his hind legs. On the wall, the second hand spun round and round. Minutes tumbled off the clock onto the top of the ice box. I looked back at the butter beans, then back to the clock. I ate everything around them, but they were still there. They stared at me with beady little eyes and drooly smirks. They taunted me. I looked again at the clock. Six twenty-five. Time was running out. I took aim, shut my eyes. I bayoneted the fattest one with my fork— bit into it. I gagged. The bean had the consistency and dryness of a hard-boiled egg yolk. When I bit into it, my mouth became that rotting sump pit. My mind and body, for once in agreement, refused them. A Cold War standoff between the old man and me was declared. I sat at the table in the semi-dark, alone, enduring the demonic giggling of the cold sump pit butter beans until bed time. She could have put anything but butter beans on my plate and I would have wolfed it down. She knew that then. Butter beans would occasionally show up on the plates of the rest of the family, but not mine. After that night, I never missed an episode of the Lone Ranger because of a helping of butter beans. I may have missed one or two for lying; I can’t remember. I still don’t have an I-Phone. A recovering educator, Doug Elwell spends most days writing, reading about writing and thinking about writing. Some of his short stories and essays have appeared in his hometown newspaper, Country Crossroads. He has also been published in a Kindle collection of essays and short stories, Ignite Your Passion: Kindle Your Inner Spark. When he dies, he’d like to come back as his dog. The timing might make this a little difficult since the dog is already dead, but if it could be worked out, he’d like that—for the company. Doug can be contacted via email at: djelwell@mchsi.com. I love this. I used to listen at the same hour – in England. 6.30 was dedicated to listening to a radio series for years. 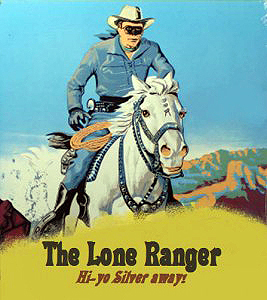 When it wasn’t the Lone Ranger it might be riders of the Range, or later Journey into Space. And I too would eat everything until the dread day someone came up with something that turned my stomach – Jerusalem artichokes. The tried to tell me it was boiled potatoes – but I could tell by the smell it was not. And sat and stated at them for hours before someone finally let me go. Thanks for the memory. Thanks for the nice comment. I’m glad the piece resonated with you. I had a lot of fun putting it together. I suspect most of us have a similar story buried in the basement of our memory. Thanks for the comment. I used basement because I don’t go down there much! I loved this piece. It reminded me of the countless times I sat at the dinner table for hours because I’ve always been a picky eater.